Scorpio characteristics can sometimes seem intense and they tend to get a lot of negative stereotypes as well. But when you take the time to learn about and understand the personality traits of Scorpio, you can learn exactly what it takes to keep a Scorpio sign happy. Scorpios’ birth dates range from between October 24th until November 22nd. Their symbol is the Scorpion and as a water sign, they can be very emotionally powerful people. Some words used in the typical Scorpio description include controlling, jealous, emotional, forceful, compulsive, and secretive. While many of those words don’t typically have positive connotations, the Scorpio is not a bad person – you just need to get to understand how they think and why they do the things they do. If Scorpios learn how to harness their energy into something positive, much good can be accomplished. It is important for a Scorpio to learn how to use their traits in a positive manner in order to achieve happiness. Scorpios must learn how to control their impulsive urges and their passion in order to be happy. Once they do so, the sky is the limit. Many Scorpios often seem as if they are withdrawn from the rest of the world. They do not like being the center of attention, and usually will feel slightly uncomfortable in social situations. This does not mean that they are anti-social; in fact, some can be very pleasant and friendly at social gatherings – they just typically would rather be at home or in a more isolated environment. They can sometimes be seen as loners, but this does not mean they do always like to be alone. They also aren’t typically boring people, since they often can make any situation a little more exciting easily. The Scorpio, like most water signs, often struggles with harnessing their emotions. It can be hard for them to contain them, especially when they try very hard not to express them to others. For this reason, it is not unusual for them to have large outbursts because they don’t tend to deal with and express them until they are overwhelmed. The rest of the time they may seem stone cold and unaffected. 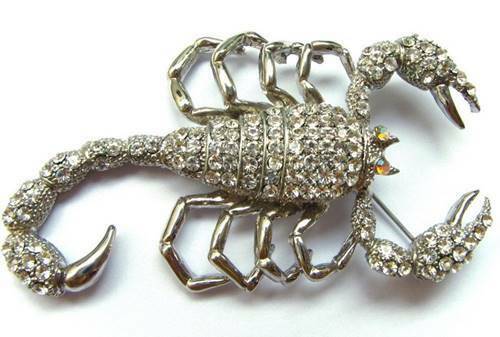 The Scorpio is very sensitive and defensive in nature. Just like a scorpion, it will attack if it senses even the slightest of threat. They do not handle criticism well, nor do they really like praise or flattery. The more neutral you are toward them, the better. The Scorpio can benefit from learning that not everything that happens to them should be taken personally and how to better keep their feelings in check. Scorpios can have great will power, and so it is easy for them to accomplish many things if they are not swept away by emotions. They have much determination to do what is necessary to reach their goals. They can be successful in many careers. If they have a cause to be passionate about, they can very likely make results happen. Scorpios have great zeal in researching and learning more about the deeper side of things. They are not always happy with what may seem obvious or what appears to be on the surface. For this reason, they can make for excellent physicians and scientists, who always question the ‘whys’ and won’t accept mediocre answers. As a friend, they will use this trait in getting to know the deeper side of you that others may not see. In relationships, the Scorpio is often afraid of getting hurt, and so it can be difficult to grow close to them right away. Once they find someone they love, it is typically for the long haul and it will be a passionate relationship. They will get to know your deeper side, though it will be hard for you to get them to open up in the same way to you. However, it is possible. Scorpio relationships have a tendency for jealousy and resentment, so learning how to deal with these things will help them have healthier and happier romantic endeavors as well. Although Scorpios possess a lot of negative traits and characteristics, if they instead choose a positive path, they can use these traits for many good causes. Their determination can help them to achieve many great things, and their quest for the truth and investigating into things deeper can help them make very important discoveries that can be beneficial not only for themselves, but often for others as well. Do you have any insight or experiences to share about the characteristics of Scorpio? Tell us in the comments section below! How does a Scorpio harness said things?